Yesterday, I posted on one of the images I had worked on from the Galileo's E11 orbit, that last of that spacecraft's primary mission. This evening, I finished processing the rest of the images (except for the eclipse images) from that orbit. 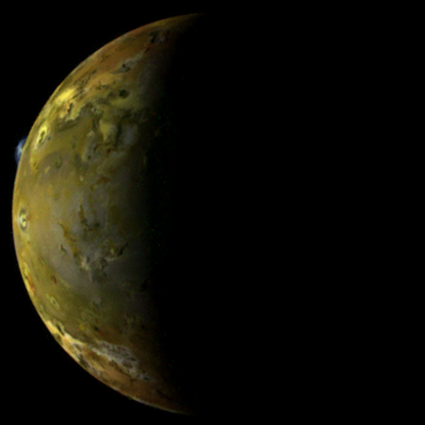 These images were acquired on November 7-8, 1997 and for the most part show Io at high phase angles. These observations were designed to look at the state of Io's plume activity at the end of Galileo's primary mission. In these images, a total of five plumes were observed: Prometheus, Zamama, Marduk, Pillan, and Kanehekili. 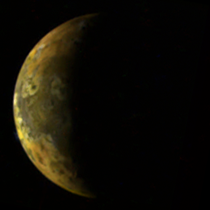 The Pillan and Kanehekili plumes were only observed twice by Galileo, while the other three were observed at various times throughout the Galileo mission. The Kanehekili plume stood out to me while looking through these images. The plume is visible in the 11ISKANEHI01 observation. Enhancing the contrast of the VIOLET filter reveals something rather interesting about the Kanehekili plume: there are two eruption columns separated by about 70 km. This would suggest that there are two plumes at Kanehekili (or at least two plume sources within the flow field). Both were formed as different flow lobes from Kanehekili 1997 eruption overtook an area of sulfur dioxide frost and launched the frost skyward. Similar behavior was seen at the Masubi flow field last year by New Horizons, though the separation between plume sources was greater in the latter case. The Kanehekili plume was also observed in May 1997. Only one eruption column was seen at the time.